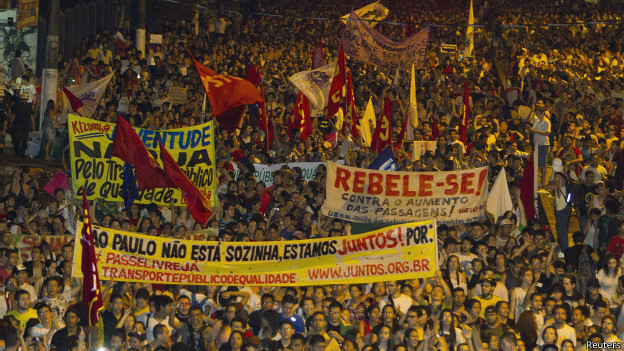 2013 Brazilian protests over increased cost of public transportation. Photo: Reuters. Oxfam’s recent report Working for the Few shows with authentic data what we have been feeling: that democracy was kidnapped by the one percent to widen and maintain inequality. It confirms that the most important tendency that exists in the world in this period of increasing chaos is toward the concentration of power and, therefore, wealth. We live in societies more controlled and militarized all the time, be it in the north or south, under conservative or progressive governments. We are facing a global tendency that cannot be reversed, in the medium term, in local scenarios. Oxfam assures that inequality has diminished in Latin America in the last decade. Certainly! But, we’re talking about the most unequal region in the world and it’s being compared with the 1990s, when inequality reached such a high peak that it provoked social explosions and popular uprisings. It interests me to emphasize the tendency toward militarization: the kidnapping of rights and the criminalization of protest. Those below live in a “state of permanent exception,” following the maxim of Walter Benjamin. Militarization is neither transitory nor accidental. It does not depend on the quality of governments nor on its discourse nor of its ideological character. We’re dealing with something intrinsic to the system, which can no longer function without criminalizing popular resistance. When the manual defines what those forces are, one can read: “movements or organizations;” “persons, groups of people or organizations acting autonomously or infiltrated into movements.” When it details the “principal threats,” it says: “blocking public roadways;” “urban disturbances;” “invasion of properties and rural or urban installations, public or private;” “paralyzing productive activities;” “sabotage in places for large events;” in sum, a good part of the repertoire of action of social movements. It is a good example of militarization and of the criminalization of protest. Strictly speaking, the GLO is the updating of a group of norms that figure in the Constitution and have been regulated since the 1990s. What’s symptomatic is that it is updated after the massive June demonstrations when the FIFA Confederations Cup was held, and when a part of the popular movement announces new actions during the coming World Cup of Soccer (Futbol). Therefore, any mobilization during “large events” is considered sabotage. That is the predisposition of a government like that of Dilma Rousseff, which passes for being more democratic that those of Mexico and Colombia, for example. The problem is not that the government of Brazil might have changed, but rather that the State feels the need to respond to the challenge from the street and it does what any State does that has self-esteem: it guaranties order at the expense of rights. What we’re dealing with in this case is assuring that one of the most corrupt multinationals, the FIFA, can celebrate its most lucrative activity without being disturbed by collective protest actions. I insist: it is just an example; I don’t want to focus in Brazil. Faced with the escalation of militarization that travels around the world, those below organized into movements are far from having any kind of answer. Moreover: our strategies, born in periods of “normality,” are showing limits in moments of crisis and systemic chaos. In the first place, we need to be conscious of those limits. Secondly, we must learn to defend ourselves. As the Chilean historian Gabriel Salazar points out: “Popular power is the only way to have a true democracy. People that have rights but have no power are nothing. The law has no value without power.” The community defense systems teach us something about the construction of power among those below. The labor movement had a vast experience, until the rise of Nazism, about forms of self-defense. It may be the time to refresh them.